Comstock’s Rotary Spader---This rotary spader was invented for easier labor in tilling the soil. It had several tines that when rotated dig into the earth and turn the soil. 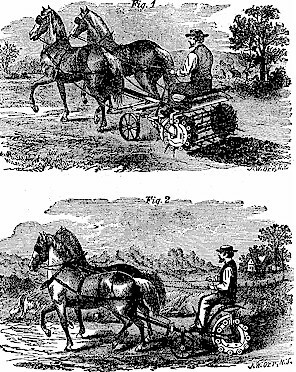 There was the two horse spader, which is pictured, and then a large and small four horse spader and also one designed to be pulled by a yoke of oxen. 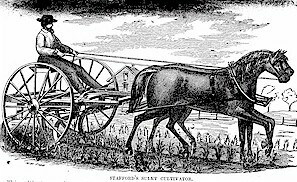 Stafford’s Sulky Cultivator---This cultivator was invented by an Illinois farmer in order save time when cultivating between rows of corn. Missouri farmers began to use it because it saved over two-thirds of the labor over a single shovel cultivator. 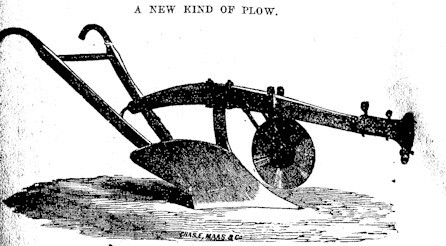 The illustration shows that it had four shovels which allowed the farmer to cultivate on each side of the corn row at the same time, instead of having to go up one side of the row and back down the other. Rock Island Plow---This plow was becoming well known in the state of Missouri and southward for its hardiness and durability against the hard soil. “These celebrated plows are manufactured by an entirely different process from all others now in use. The mouldboards, shares and landsides are cast by pouring molten cast steel into iron molds, thereby chilling the steel, which, with the patent process of hardening, gives them a much harder and smoother surface, besides extreme durability, than ever before attained, causing them to scour any soil, to run lighter and with less friction than any other plow, consequently they will last as long as two or three ordinary ones.” (Missouri State Board of Agriculture, First Annual Report 1865, 2nd Series).